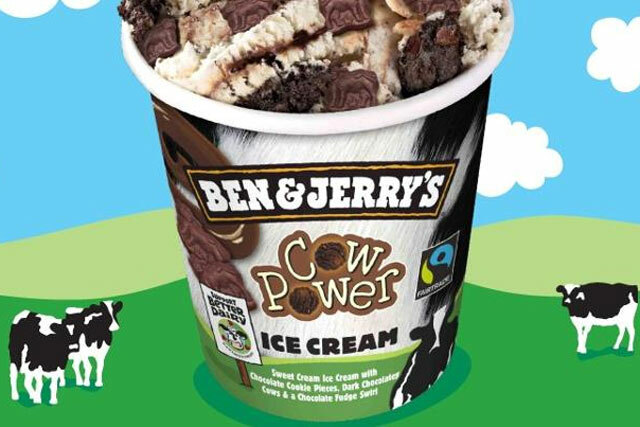 Ben & Jerry's, the Unilever ice-cream brand, will deliver its new Cow Power ice cream to teams of office workers in London who take to Twitter to demand "all cows should be happy cows". It will visit the offices of people who have tweeted their support for "happy cows", between 9am and 4pm. Individual entrants must tweet, "I believe all cows should be happy cows @benandjerrysUK #cowpower", with the company's hashtag. The teams that send the most tweets will receive the ice cream. The 'Supporting Better Dairy' campaign is a joint initiative of Ben & Jerry’s and NGOs Compassion in World Farming and the World Society for the Protection of Animals (WSPA). It aims to create recognised standards for dairy cows across Europe. The new Cow Power ice-cream, which includes cow shaped chocolate chips, will go on sale exclusively in Sainsbury's stores in early October, for a recommended retail rice of £4.49. It will be available in Ben & Jerry's Scoop Shops from 2013. Ben & Jerry's, which has a track record in cause-related campaigns, in March changed the name of its Oh My! Apple Pie ice-cream to Apple-y Ever After, in support of the UK's proposal to legislate in favour of gay marriage.